Since immersing myself in the theatre blogging community this year, I've come across several other amazing bloggers. 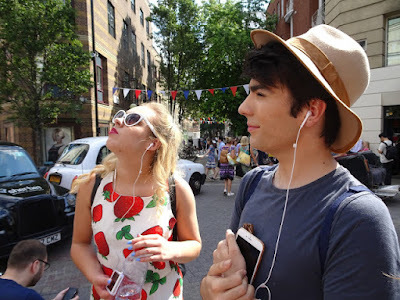 Just a few months ago I started chatting to two other bloggers, Shaun Nolan and Em Jenkins who both have blogs that focus on similar topics to mine and we all definitely share the strongest passion for theatre! When Shaun heard that I was making a trip up to London, he very kindly invited me for a day out and to stay with him over the weekend. What an absolute sweetheart. Despite my family and friends' fear of my internet friends actually being catfish, I met Shaun, Em and Meg (Em's sister) at my favourite cafe in London, The Theatre Cafe. We sat drinking smoothies, surrounded by musical memorabilia and chatted about everything under the sun for nearly three hours. Time honestly zoomed by! 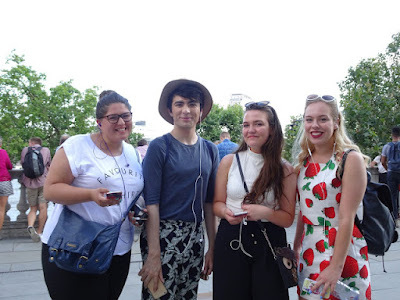 It was absolutely lovely to spend time with my new friends, who didn't feel like new friends at all- its amazing to find people that you automatically feel so comfortable and get on so well with! We then made our way to the gorgeous Victoria Embankment Gardens and sat in the glorious (boiling) sunshine as we waited to meet some other bloggers and friends who would be joining us for the afternoon. The purpose of the afternoon was to launch Shaun's new walking tour in collaboration with VoiceMap called 'Light The Lights: How Culture Defines London'. 'Light The Lights' takes you on a tour of central London, pinpointing the most precious spots of this culture- rich city including theatre, architecture and literature. I understood how hard Shaun had been working on this super exciting project so I couldn't wait to finally try it out for myself! We started the tour at The Black Phonebox outside Victoria Embankment Gardens, where Shaun explained the historical importance of red vs black telephone boxes that dated back to 1980s. This was the first of many fabulously quirky facts that was packed into the tour. Throughout the tour we explored The Underground, beautiful memorials, spectacular theatres, adorable cafes, bustling high streets and much more! My favourite spots on the tour were The Seven Dials, Magistrates Court, Charles Dickens Coffee House, Somerset House and Goodwin's Court. The fact that stuck in my head the most, and really made me smile, was at the Royal Opera House where a uniquely structured bridge (its shape almost looked like a strand of DNA) connected the Royal Opera House to the Royal Ballet School. Its called The Bridge of Aspiration, aptly named to show the aspiration of the students who cross the bridge to perform their shows at the Opera House. I think that's absolutely lovely, and something I would never had known without Shaun's tour! As someone who doesn't visit London much, and when I do I mainly stick to Oxford Street and a few theatres, it was so refreshing to get an insider's view to one of my favourite cities in the world! The facts were mind-blowing for someone who has very little knowledge of the city and I found it so interesting. This tour honestly made me fall in love with London even more, strengthening my ambitions to live there someday. Its also definitely inspired me to explore the city more, as there is so much to see beyond the tourist hotspots. I had SO much fun on Shaun's 'Light The Lights' walking tour. I wish I could show all my friends and family it... maybe next time we make a trip up to the city! The app is super easy to use and navigate around the city. All you need to do is download Shaun's tour 'Light the Lights: How Culture Defines London' for £2.99 on the free VoiceMap app, available on the app store, plug in your headphones, hit play and you're on your way! Thanks to Shaun and all of my other lovely new friends for an amazing weekend. I'm so happy to have met such fantastic, interesting and plain lovely bunch of people. Make sure you check out the tour for yourself here! Disclaimer: All thoughts and opinions my own, as always! Photos by Em Jenkins. Usually small concerts are the most intimate and played by bands the best but they are rarely added to the list of events in the news list on https://ticketselect.co.uk/london. In the search of reliable sources for more events, I find my winner. Don't miss a hint!